Make the bees work for you! I have always been fascinated by different kinds of materials and combinations of them as there are thousands of different possibilities of the outcome. And especially in art or design works where you can feel that the material was completely ‘understood’ by it’s artist or designer. It was exactly that feeling that I got when I saw Tomas Gabdzil Libertiny’s Honeycomb Vessel #2 in the Boijmans van Beuningen Museum in Rotterdam. 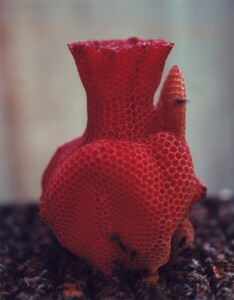 The Paper Vase or the Honeycomb Vases demonstrate a new way and approach of working with materials. This means that natural processes have to be understood and investigated from all different kind of perspectives. I like this thought and I think it is a crucial one for ‘sustainable’ design. We should communicate with our environment and understand it. Therefore it is important to take advantages of the things that are already there. The Honeycomb Vases symbolize this crucial understanding. 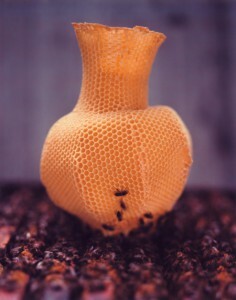 In collaboration with beekeepers he found a way to make the bees build a vase like shape. The vases are created by placing a basic beeswax mould printed with a honeycomb pattern into a beehive. The bees then start to work with that pattern. It took 40,000 honey bees that worked over a course of one week to create one vessel! Libertiny himself calls this process ‘slow prototyping’. Every vessel has a unique form and they also vary in color and smell depending on the flowers that are in season.